My love of Doritos is no secret out here. But I am really not a huge fan of Taco Bell. I rarely eat there and when I do, it’s only to get a Mexican Pizza and a side of rice. The people at Taco Bell must know this about me. So their evil plot last year was to make a taco out of a Nacho Cheese Doritos chip. Their evil plot worked, but only for a few times after I was tempted enough to devour one of these Dorito creations. 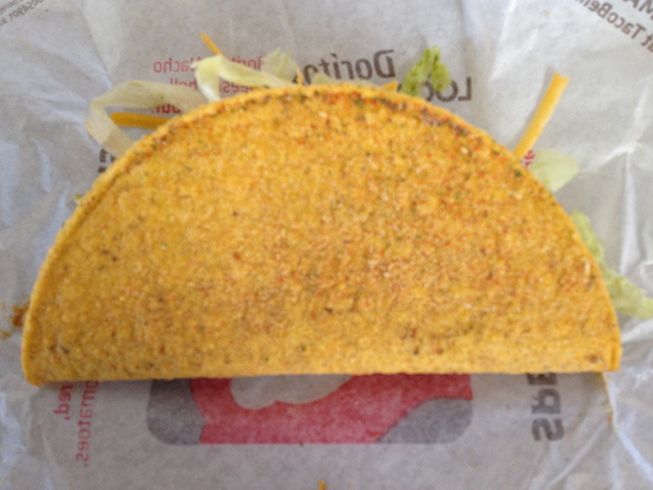 The Nacho Cheese Locos Taco is very good. Aside from the lack-luster meat Taco Bell uses and the orange-coated fingers that needed a wet wipe to clean off, this is something I could add to my approved list of items I eat at Taco Bell. 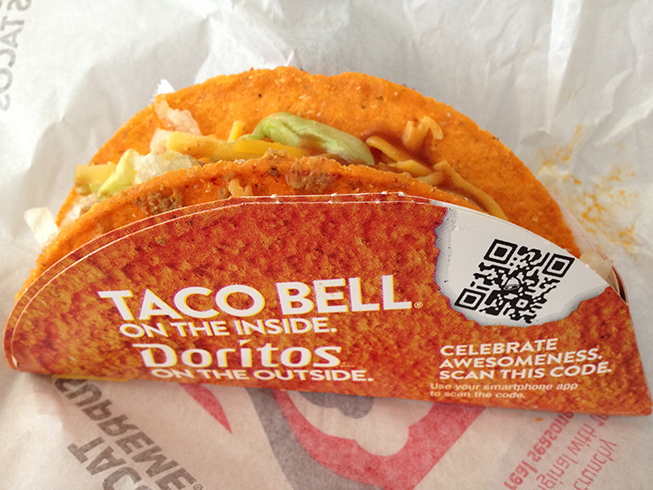 Fast forward to last week when Taco Bell launched another Doritos-themed taco – Cool Ranch. I held off until today to go try one. The flavor was definitely Cool Ranch, lifted right out of the bag of those addictive tortilla chips. The meat was slightly better than the Nacho Cheese taco I had months ago, so maybe there has been some improvements to it. All of the fixings: lettuce, cheese, tomatos.. all mixed well with the crunchy shell and it’s Cool Ranch seasoned sides. I did need a wet wipe to clean off, but my fingers stayed the same flesh color they normally are. Taco Bell has done it. They have made a product that appeals to the Doritos lover in all of us. Let’s see what they do for a third round of Doritos-laced goodness. If I liked Doritos more I would probably check these out. I’m pretty such a corn chip and salsa girl all the way. Like I would devour an entire jar/bag and then play dumb when Vahid asks why there are so many empties in the trash/recycling. Ha ha… and yes, you would have to like Doritos to like these tacos. A couple of us at work tried these and I’ll have to agree with you, they’re bloody delicious. Yes, they are so good.